Rex by Berry Van der Vorst got a Diamond award at BIAFF 2009 and the Best Story award. Despite my youth, I seem to be fascinated by the concept of aging and the extreme consequences this sometimes has on body and mind. Although this is not a subject that is very close to my personal life in any way, I believe it must have something to do with my semi-obsession with history in general. Occurrences in the past that resound in the present fascinate me, apparently! Rex is not the first time that I have tried to deal with 'age' in my films. My previous film Nexus'(which won a Gold Standard at the 2006 BIAFF in Bedford) also tackled this subject and my next project Vincent'(working title) will include themes related to aging as well. Every person deals with history in one way or another. In the progression of life, we all look back now and then to the moments that we remember best. That's exactly the principle I tried to focus on: a single moment that changes someone's life forever. I thought that was a very exciting, though not highly original, foundation for a screenplay. But before I could start writing, I needed something more concrete, a very specific situation to start from, in order to make our story as 'fresh' as possible. I found that 'situation' in my own recollection of a play I once attended at a local theatre. It was the well-known story of Anne Frank, but it was done in a somewhat impressionistic way, where sound and light effects formed an integral part of the storytelling. Especially the ending, where German troops storm up the stairs, left an everlasting impression on me. The writing process lasted several weeks, but eventually produced a first and rough version of the script. Together with a couple of friends I fine-tuned the story and its themes, until we had a filmable final screenplay that worked on all the right levels. As I usually do, casting was done primarily via the internet, thus providing a seemingly endless list of emails, CV's and photos. However not all characters were cast that way. 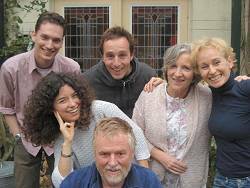 Casting for Lise, the two kids and some of the supporting actors was done by our producer, Gislind Stuut. She very conveniently used her own creative network to select several top notch actors, who indeed performed wonderfully. For all the main characters, I wanted actors that looked more or less 'normal'. They shouldn't have very deep, dramatic faces or look extremely pretty. These people were supposed to immediately take the audience by the hand, so casting a model or a tramp would decrease this potential empathy enormously. I like to work fast and efficiently, so we opted for a tight schedule. We planned to shoot the film in four days in April and early May, 2008. Since the majority of the picture took place inside Lise's house, location scouting was relatively easy. The hardest part must have been convincing the owners of the property, after all we would be invading their house for three full days. But they happily agreed after reading the screenplay and having several conversations about the plot and its background. Rehearsing is something I do not like. I know some actors can't imagine shooting a film without it, but I find rehearsals redundant and a factor that slows down the process enormously. Most actors I work with are relatively inexperienced with film. Some of them have experience in theatre, but that's a whole different concept altogether. Working on a film usually means working under a tight schedule, so all your preplanning and preparation should be done in advance. Except for the acting. This is the singular component that should be as fresh and pure as possible. The actors should know their roles and characters, sure, but the scenes and the interpersonal dynamics have to emerge on set, in front of the camera. For me that's the only way to get a lively and convincing performance from a cast. Rehearsing kills the spontaneity, so to speak. The fact that our entire cast has done a tremendous job, maybe underlines this opinion. Anyway, I'm very proud of every single one of them. Everyone, from Lise and Uncle to the two young kids, gave their absolute best. I thank them for making Rex what it has become. After a total production period of close to 5 months, Rex premiered at a crowded theatre in Utrecht, the 'film capital' of The Netherlands, on August 25th 2008. The film was received with mostly positive reactions. I am very thankful that the majority of our audience likes what we've done, this is extremely satisfying. Because let's be honest, applause from an enthusiastic room full of people is the ultimate crown on your career as an amateur filmmaker. But beside the joy of showing your movie to audiences, it's the core of the thing, the 'togetherness' that makes filmmaking what it is. Those are the moments when I'm truly happy: on set, with a supporting and enthusiastic cast and crew, working on something you love so dearly. That's filmmaking.